BIRMINGHAM — Supervisors did not approve the changes to a landscape plan on township resident Victor Leonhard III’s property on Brinton’s Bridge Road at the monthly meeting Monday night. Leonhard runs a landscaping business from his property in a building, which the township approved the construction of in 2010. The final step to this project is the planting of trees near the building. Leonhard came to the township meeting to present his proposed adjustments to the original tree plan, including a change in the location and species of the trees, as well as a decrease in the number of trees. The new plan would put the trees at a higher elevation and closer to the building. The reasoning for the changes, Leonhard explained, is to create a better screen of the building. The new species of trees, including Leyland Cypress, will grow faster and taller than the original plan to have blue spruce, Norway spruce and holly trees. “This is going to be beneficial, I think, for myself and everyone around the building,” Leonhard said. Supervisor William Kirkpatrick said he did not have a problem with the change in location of the trees, but was unfamiliar with the new species and was not happy with the reduction of trees. The original plan included 40 trees, but the adjustment has eight less trees. Kirkpatrick also expressed his concern that none of Leonhard’s neighbors were present at the meeting, and the township should be sure they are aware of the changes before they approve it. He noted that the original discussion of the building on the property had extensive input from the neighbors and it’s only right to have their approval for this plan as well. Supervisor Scott Boorse said he did not have any concerns about the proposed changes, but agreed that the neighbors should have a chance to voice their opinions. “It would be nice if there was a way you can get some feedback to the township that the adjoining neighbors are satisfied with this change,” Boorse said to Leonhard. 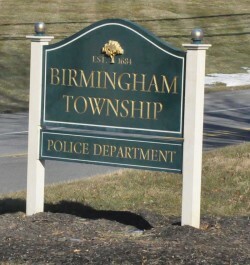 Supervisor John Conklin agreed that the township needs some form of documentation showing the consent of the neighbors. Therefore, the supervisors agreed that Leonhard can bring this plan back to the board at the next meeting on July 1 after he has sent a letter to everyone within 500 feet of the property explaining the changes. The recipients will have 30 days to respond with any comments. If the township receives no response, it is assumed that no one has a problem with the plan. Leonhard agreed to send letters and return with feedback at the next meeting. Following this decision, the supervisors discussed a number of other topics. Township Roadmaster David Rathbun presented a revised 2013 Road Program to the board, and said the estimated total cost is $14,600. Conklin commented that the cost is low and asked if there was anywhere else that needs repair. Rathbun responded that “there really isn’t anything out there that needs to be done.” He added, however, that between now and the end of the year, more areas may be found that need fixing. Boorse brought up a past discussion, asking Rathbun if he had any more information about the use of slurry and the possibility of other processes for road restoration. Rathbun replied that he and township engineer Jim Hatfield will be prepared to present information about other processes to the board in the fall for consideration for next year’s road program. The board approved the road program, allowing Hatfield to proceed with soliciting bids from a minimum of three contractors. Conklin also brought up a topic from the last meeting regarding a resident’s concerns of the number of accidents on a curve in Birmingham Road, resulting in damage to her property. Conklin said that Police Chief Tom Nelling wrote to the Pennsylvania Department of Transportation (PennDOT) about the issue and they are waiting for a response from them. “PennDOT has already been out and done some research on it, and they are going to come back to us with their answers based on their policies and procedures,” Conklin said. Finally, Conklin presented the proposed repairs to the township building, and asked the other supervisors to approve his suggestion of requesting $10,199 for the renovations. The renovations will include repairs to the entranceway, the gutters, the back of the garage, the shed, the reception counter, and the front door, as when as the replacement of at least some of the shutters. Boorse and Kirkpatrick agreed to this plan, noting that there has been very little maintenance done to the building in the last few years.